Paediatrics is one of the most challenging but rewarding areas of medicine. Although a distinct discipline in its own right you may well work in one of the specialities within paediatrics itself. A paediatrician’s uniform must inspire confidence in parents without intimidating young patients. Whether you’re a generalist or neurosurgeon we have stylish and comfortable paediatricians’ uniforms. There’re also no minimum order requirements and your name or logo can be added to most garments. Scrubs are essential paediatricians’ workwear. Ours are superior quality, made from a specially developed 67% polyester and 33% cotton fabric. Its light to wear and the design is intended to make the garment resistant to bacteria as well as being comfortable and allowing freedom of movement. Our Unisex Scrub Tops are available in 5 colours including Unisex Scrub Top – Jadeand Unisex Scrub Top – Light Blue. We consciously offer a wide range of sizes – from XSmall to XXLarge. In other words the sizing accommodates petite women and larger men. To ensure the tops are as practical as possible they feature 3 external pockets and side vents. The tops have a finished length of 77cm. 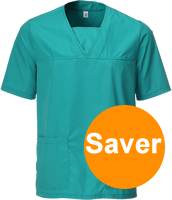 A Saver Pack Of 12 Unisex Scrub Tops - Medical Scrubs is also available and there is no penalty for mixing sizes or colours: You still get the same great deal. Unisex Scrub Trousers are available to buy separately and are available in the same range of colours including Burgundy and Sailor Navy. The trousers fit comfortably, having an elasticated draw cord waist. They also have 2 thigh pockets and 2 shaped pockets to the front. 2 leg lengths are available: Regular (74cm) and Tall (79cm). XSmall to XXLarge sizes are available. We also design a range of Tunics. For men, styles include our Male Tunic with Mandarin Collar & Epaulette Loops. This fastens to the right, asymmetrically and each shoulder has 2 fabric epaulette loops. Epaulettes can be bought separately. It has 1 breast pocket and 2 lower pockets and a waterproof pen pocket set within the right front pocket. It has an 80cm finished length. We also offer a more traditional Male Tunic – White also available in a Saver Pack of 10 Male Tunics – White. All male tunics are available in sizes 36 to 54. For women we have a selection of female tunics in plain or stripe fabric including Female Tunic – White in sizes 8 to 28. It’s also available in a Saver Pack of 10 Female Tunics – White. All our standard female tunics have a concealed front zip closure and 4 pockets: 2 breast pockets and 2 hip pockets including a pen pocket. The short sleeves have shaped cuffs and rear vents with action pleats complete the look. For those occasions where a coat is required our range of Coats includes a Unisex Lab Coat and a Coat with Lower Pocket. Both are available in sizes 92cm to 140cm and have an inside pocket. The lab coat is also styled with a stand collar and knitted cuffs.